If you’ve seen the Easter bunny, participated in an egg hunt, or received an Easter basket, then it’s assumed that you’ve seen the colorfully decorated homemade Easter eggs. You know the ones – the fresh eggs that you hard boil and then dip into a rainbow of liquid dyes. You’ve probably even made some with your family to enjoy during Easter dinner! Consumers often purchase a dye kit that includes mini tablets to be dissolved in water, a few metal tools to keep the eggs secure while dipping, and a wax crayon for drawing designs on the eggs before dying them. Most packages also have Spring themed stickers, a perforated box that can hold your freshly colored eggs, and a puzzle for your kids to complete while patiently waiting for the eggs to dry. Have you ever considered what’s in those small dye tablets? The ones that look like candy and dissolve to evolve into glorious colors? (Note: Please make sure your children don’t consume these little capsules like a piece of candy!) Some of the ingredients are fine, such as maltodextrin or sodium bicarbonate. But many packaged egg dyes contain unwanted coloring agents instead of all natural ones. Yes, dropping a little lozenge of color into a cup of water is fast and easy. But making your own homemade Easter egg dyes with natural food colorings is easier than you think! Not to mention, if your eggs accidentally crack and are contaminated with color, they are still safe to eat with these all-natural dyes. For each of these colors, begin with 1 cup of water (dyed using the methods below) plus 1 tablespoon of white vinegar. As an alternative to vinegar, you can use the equivalent amount of lemon or lime juice. Directions: Boil water and add the necessary ingredients (see list below). Remove the ingredients and allow the water to cool before dipping eggs into it. For some colors (such as the ones that use spices), the water only needs to be warmed and does not need to boil; you also do not need to strain out the spices from these mixtures. Pink: Boil chopped beets in water for 20 minutes. Or dilute the juice from crushed pomegranate seeds. Orange: Simmer yellow onion skins or carrots in water for roughly 15 minutes, until the water turns orange. Or mix 3 tablespoons of chili powder into warm water. Yellow: Mix 3 tablespoons of turmeric or cumin into warm water. Steeped green tea or chamomile tea will produce various shades of yellow as well. Green: Boil 2 cups of spinach for 30 minutes. Blue: Boil shredded red cabbage for 20 minutes. (Yes, red cabbage will dye your eggs blue!) For a gray blue, mix 1 cup of frozen blueberries in 1 cup of warm water; allow to sit for 20 minutes, then discard blueberries. Purple: Steep a strong cup of Red Zinger Tea for a lavender color. Or dilute ½ cup of grape juice in ½ cup of water. Brown: Mix a cup of strongly brewed coffee with water. Tip #1: Become a scientist in your own kitchen! Feel free to adjust the ratios of water and dyed liquids depending on the shade of the color you desire. For example, adding additional water will create a lighter shade, while using less water will offer a more potent color. Tip #2: Don’t forget that you can allow the eggs to sit in the dye for up to 24 hours to ensure a more vibrant shade! You can also try dipping an egg in the liquid, allowing it to dry, and then re-dipping it to deepen the color. Tip #3: Create the dyed solutions in mason jars, which are the perfect size for holding a few eggs at a time. Plus, if you decide to let a few eggs sit in the solution for an extended amount of time, you can screw the lid on the mason jar and store it in the fridge. Tip #4: Need some metal tools to dip the eggs in the colored dye without using your hands? Unfold a paper clip and rework it into the shape of a lowercase “b” (or “d” or “p”). Test it out by setting an egg into the circular part and holding the stem. Spoons will also do the trick but tend to create more of a mess; if you use a spoon, opt for a slotted one. Tip #5: The USDA recommends that your eggs should not remain at room temperature for longer than 2 hours. If you decide to dye the eggs for an extended amount of time, stick the egg inside of the solution and place in your refrigerator. Tip #6: As long as your freshly dyed eggs aren’t cracked, they are fine to hide outside for your annual Easter egg hunt. Be sure to hide them in sanitary places. If one of the eggs is cracked, it’s not recommended that you place it outside on the ground; this could allow bacteria to penetrate beneath the shell and onto the egg. After your festive game, wash and re-refrigerate your eggs. Tip #7: To ensure freshness, it’s best to eat your beautifully decorated eggs within 7 days of boiling. 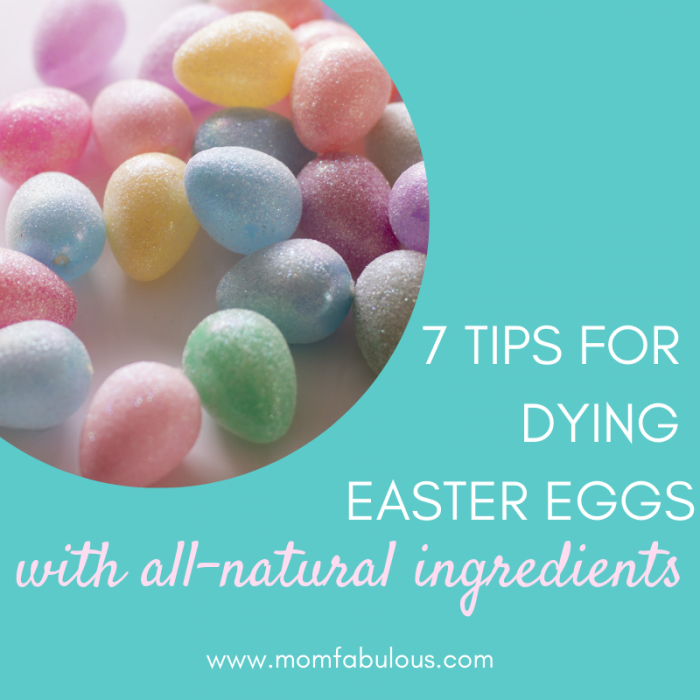 Gather your children and family around the table for an exciting occasion: dying Easter eggs! 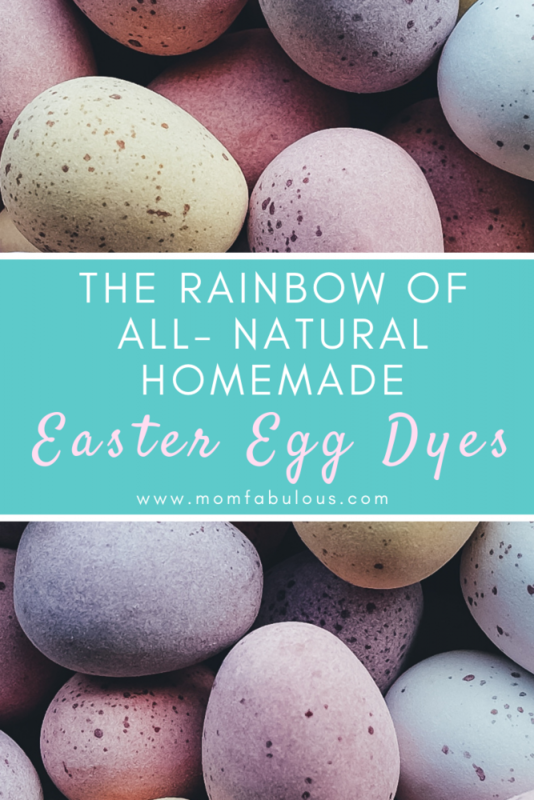 Who know how easy it was to create all natural, homemade egg dyes? Grab those ingredients out of your kitchen and pantry to start the rainbow egg-stravaganza!